In this March 19, 2013, file photo, actors Michelle Fairley, Maisie Williams, Sophie Turner, Kit Harington, executive producer George R.R. 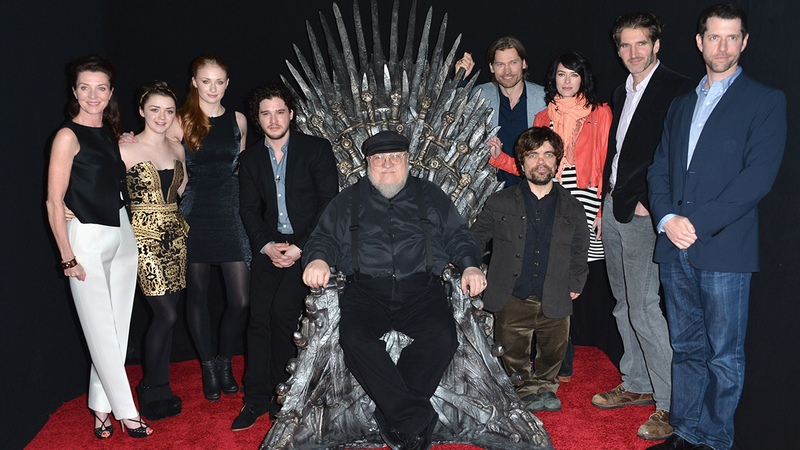 Martin, actors Nikolaj Coster-Waldau, Peter Dinklage, Lena Headey, co-creator/executive producer David Banioff and co-creator/executive producer D.B. Weiss attend The Academy of Television Arts & Sciences’ Presents An Evening With “Game of Thrones” at TCL Chinese Theatre in Hollywood, California. Over the course of eight seasons, “Game of Thrones” was filmed in more than 49 locations throughout Northern Ireland. From historic castles to rugged coastlines and ancient forests, the sites have grown popular with fans eager to visit, NBC News reports. Tourism has become big business for Northern Ireland, with the show helping to attract 120,000 visitors a year and bringing in $40 million annually to the local economy. But not everyone is so gushing about the show’s impact on their ancient land. Some have raised concerns about how the sudden influx of tourists may affect the conservation of historic sites. For many, however, the positive attention is preferable to the way things were before. For decades, Northern Ireland struggled to draw visitors, with many people associating the country with the decadeslong sectarian conflict known as “the Troubles,” even after it largely ended in 1998.